A good crib mattress will support your baby’s tiny body as they sleep. This will help their bones and joints to grow healthily. Also, they will provide superior comfort, allowing your baby to slumber peacefully throughout the night. Finally, a healthy natural crib mattress will not contain any harmful chemicals that could pose a risk to the health of your child. You may be surprised to learn that organic certification isn’t just for your veggies! In fact, more and more parents are opting to purchase organically-certified mattresses for their infants, and they can provide a safe and healthy sleeping environment for babies. 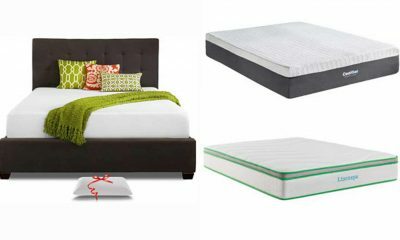 So, which organic mattress is the best purchase for your new arrival? 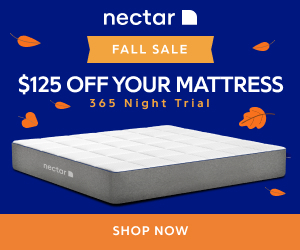 Is an organic mattress the right choice for your family? In this article, we’ve put together a handy buying guide to help you select the best organic crib mattress, complete with reviews. Don’t have time to read the whole article? Then take a look at the Colgate Eco Classica III Dual Firmness crib mattress. 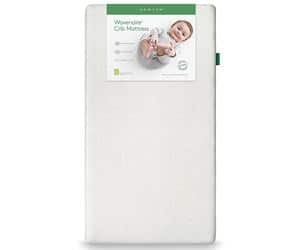 Boasting an impressive range of certifications and dual-sided firmness so it can be used into the toddler years, this mattress is our top recommendation for those investing in an organic crib mattress. 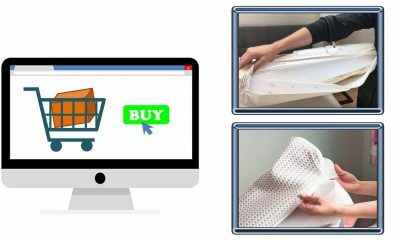 There is a lot of choice available when you are trying to buy the healthiest organic mattresses for your baby. Therefore, our mattress experts have been working tirelessly to review the most popular brands of mattress on the market today. 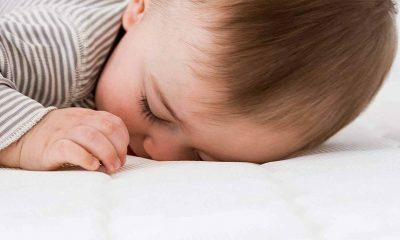 Here are the latest reviews of the 5 best organic crib mattresses. If this name sounds familiar, don’t worry! This is a completely different company to the familiar toothpaste brand. In fact, Colgate have a long history of manufacturing excellent crib mattresses.This mattress boasts the prestigious GREENGUARD certification. Therefore, it has gone through extensive testing to make sure it does not emit harmful chemicals. That means you can be sure it will provide a healthy sleeping environment for your little one. Also, the mattress cover included with your mattress is also organic. This means that the surface in contact with your child’s skin is also certified as being non-toxic. If you want a mattress that will also be suitable when your child is a toddler, this is a great option. That’s because it has dual firmness. One side is firm, providing great support suitable for a new-born. However, it also has a softer side if you turn it over. This is more comfortable for a toddler to sleep on. 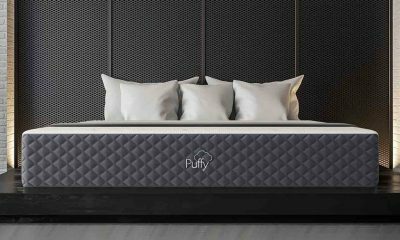 Excellent certification:This mattress is both GREENGUARD and CERTI-Pur certified. This means you can be sure that it won’t release harmful chemicals as your baby sleeps. 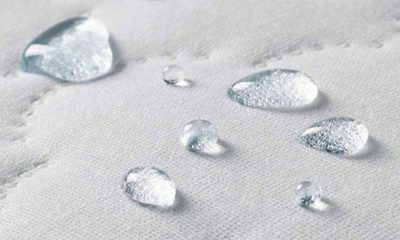 Waterproof:The waterproof layer prevents spills or urine soaking the mattress and causing hygiene issues. 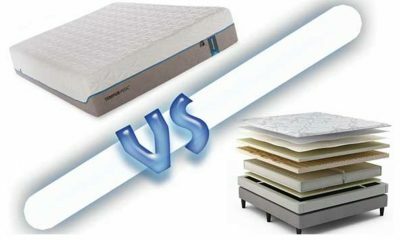 Dual-sided:The mattress has two levels of firmness. Therefore, you can continue to use it when your child is a toddler. Off-gassing:When you open your product, you will need to let it air for a few days. This is because it will initially have an unpleasant smell. This mattress has achieved the prestigious GREENGUARD Gold certification. Therefore, you can be confident that it won’t release toxins into the air as your baby sleeps. This makes it a superior choice in terms of safety for your little one. Also, it is hypoallergenic, so you can be sure it won’t trigger an allergic reaction in your infant. Furthermore, the mattress provides exceptional firmness. This is ideal to safely support your young baby as they grow. Also, the mattress is completely washable. This means you can keep your baby’s bed squeaky clean and sanitary. The breathable material helps to prevent your baby from overheating during the night, improving overall safety. Finally, this is a great choice for the eco-aware. That’s because it is manufactured from recycled materials. Therefore, it has a much lower impact on the environment whilst providing a great night’s sleep for your baby. Extra-firm:This makes the mattress especially safe and suitable for very young babies. 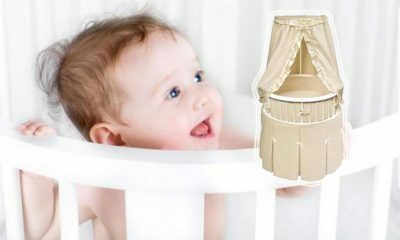 Washable:This is a great feature because it allows you to keep your baby’s bed completely germ-free. Breathable:This mattress allows the air to circulate, so your baby won’t overheat in the night. Hypo-allergenic:No more worrying about potential allergic reactions caused by your baby’s bedding. 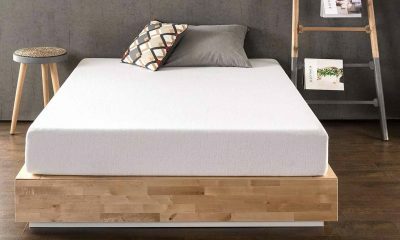 GREENGUARD certified:The rigorous certification process gives reassurance that the mattress won’t release any toxic chemicals that could be inhaled by a sleeping baby. Pricey:This mattress is a bit more expensive than some of its competitors. However, it may be worth spending a bit extra for the excellent quality of this mattress. 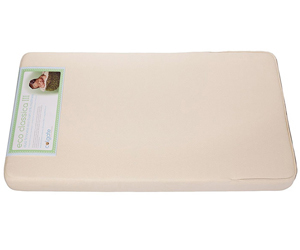 Naturpedic organic crib mattress is a great option if you are looking for an innerspring mattress for your little one. 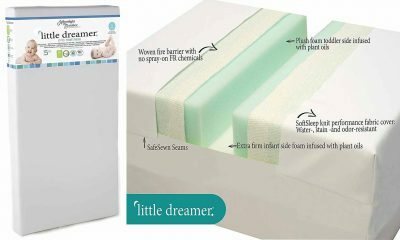 Innerspring mattresses provide great support for your growing baby, and are popular choices as they are very comfortable. 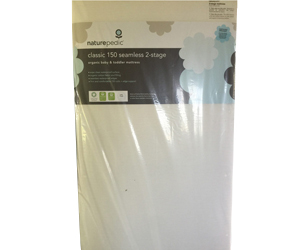 Naturepedic are a respected manufacturer of crib mattresses with many years of experience in the industry. 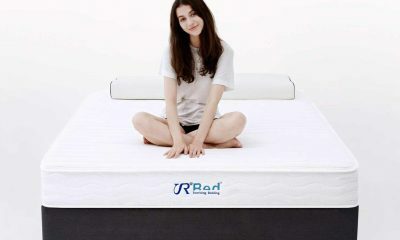 This mattress is dual-sided, which gives you a choice of firmness. There is a firm side which is most suitable for the needs of young babies. Also, the mattress has a softer side which is more comfortable for a toddler. This means you can use the mattress for longer as your child grows. The mattress has a good resistance to spills and leakages. Therefore, it is easy to keep your baby’s bed clean, dry and hygienic. Also, is has reinforced edges. This mays the mattress more durable and prevents it from slipping. 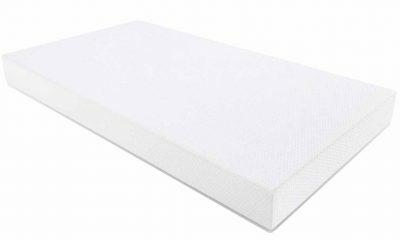 Hypo-allergenic:This mattress contains no irritant substances, so it won’t trigger any allergic reactions in your little one. Reinforced edges:This helps the mattress withstand long-term use and helps to avoid any slippage. 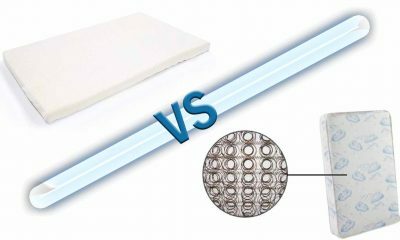 Dual-sided:The variable firmness makes this mattress suitable for both young babies and infants. Therefore, you can use this mattress for a longer time until your child transitions to a full-sized bed. Waterproof:Any leaks will be easy to clean. Low emissions:This mattress has been rigorously tested to ensure that it does not emit harmful toxins into the air. So, you will have peace of mind knowing your baby is sleeping in a healthy environment. The dual-sided nature of this mattress is a double-edged sword. That’s because neither side is as high-quality as a single-sided mattress. 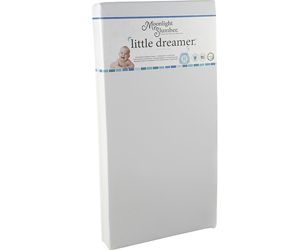 Apart from having an absolutely adorable name, this moonlight slumber baby mattress should be high on the list of anyone looking for dual sided organic mattress. The mattress is highly certified, holding both GREENGUARD and CERTI-Pur certifications. This means that it will not emit toxins into your baby’s sleeping environment. Also, it does not use any toxic plastics such as vinyl or PVC. Furthermore, this mattress is dual-sided. 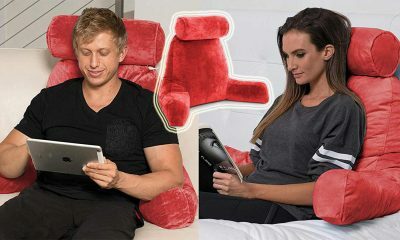 It features a firm side which gives the support that a young baby needs. 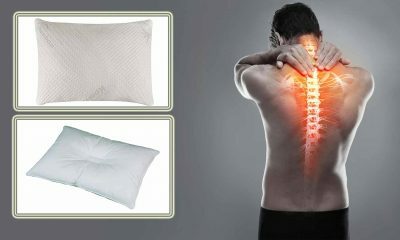 This gives excellent support for their growing joints and is much safer than a soft mattress. Also, there is a softer foam side which is more suitable for a toddler. Like adults, toddlers are more comfortable sleeping on a slightly softer mattress. Therefore, you will be able to continue to use the mattress once your tiny baby grows into a toddler. This provides a better product life and more value for your money. 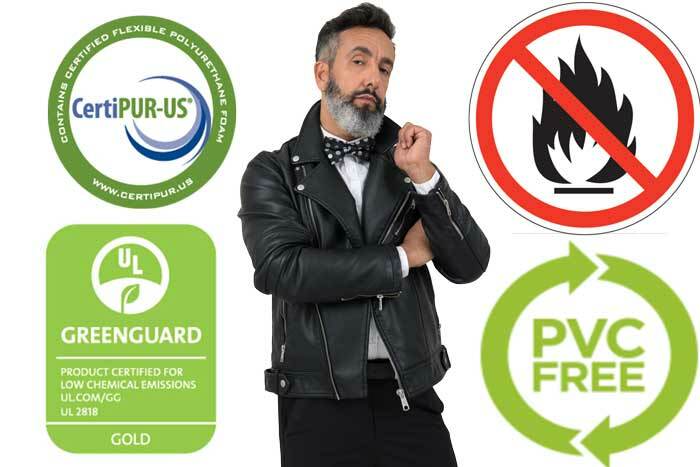 Certifications:The GREENGUARD and CERTI-Pur certifications assure you that the product has undergone rigorous testing. Therefore, you have peace of mind that the mattress is extremely safe and non-toxic. Dual-sided:This mattress offers a choice of firmness. Therefore, you can continue to use the mattress until you child transitions into a full-sized bed. Anti-microbial:There is an extra anti-microbial layer, so your child is further protected from any nasty germs. Less durable:Some users have reported that these mattresses are not as durable as other models on the market. Another product with a cute name! However, this mattress is also a great option for your baby’s crib. The mattress is made of hypo-allergenic materials, so it won’t trigger any allergic reactions in your little one. It doesn’t use any harmful flame-retardants. Furthermore, it is also waterproof. Therefore, it protects against any leaks and is easy to keep clean and hygienic. Also, this will help prevent harmful mold and mildew building up in the mattress. Also, this mattress is extremely lightweight at only 7 pounds. As you will be needing to change your baby’s bedding frequently, this provides excellent ease of use. Changing the sheets on this mattress will be a breeze because it is so easy to lift and manoeuvre. Furthermore, it has a smooth surface and secure stitching around the edges. This ensures that any urine or spillages cannot get caught in any rivulets on the mattress. Hypo-allergenic:Therefore, you can be confident that it won’t cause any allergies in your little one. Re-enforced edges:This helps to prevent any slipping. Furthermore, it adds to the durability of the mattress. 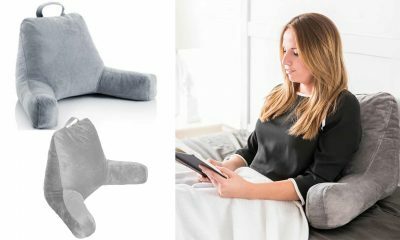 No harmful chemicals:Because it is free from toxins and harmful fire-retardants, no chemicals are released into the air as your child sleeps. Lightweight:This makes it far more convenient to perform frequent bedding changes. Less supportive:Some users have reported that this mattress does not provide as good support as other models on the market. This is a rigorous certification that assures you the crib mattress is safe to use. Also, it verifies that the mattress is made without any toxic chemicals. Over time, toxic chemicals in a mattress can have a negative effect on the health of your baby. Not only that, but the Certi-Pur certification process also checks the durability of the product. Therefore, you can be confident that the mattress will be long-lasting. This is another excellent certification that verifies mattress safety. GREENGUARD test products under very strict guidelines to ensure that they release extremely low levels of toxins into the air. Certainly, this will provide you with peace of mind and assure you that your baby will not be breathing in toxic chemicals as they sleep. Also, it’s well worth checking out the GREENGUARD website. They provide excellent advice on other ways to reduce toxic chemicals in your baby’s nursery. Many crib mattresses use a PVC layer because it provides good waterproofing. However, the FDA state that PVC in bedding can pose a risk to the health. PVC is quite a toxic plastic and these chemicals can be absorbed through your baby’s skin. This is a particular risk if your baby suffers from any kind of health condition. 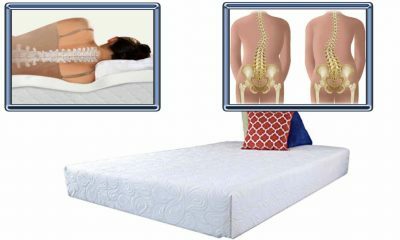 Therefore, a high-quality organic mattress may be a good choice as they do not contain PVC. 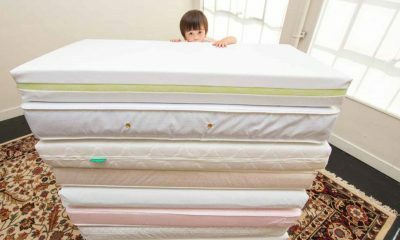 Many crib mattresses use chemicals called PBDEs in order to provide fire protection (Source: NIH). While this may sound like a great feature, these chemicals are not necessarily a good thing. They release into the air over time and can cause a wide range of health problems in small babies. Therefore, you’ll probably want to make sure they are not present in your baby’s bedding. What are the Benefits of An Organic Crib Mattress? 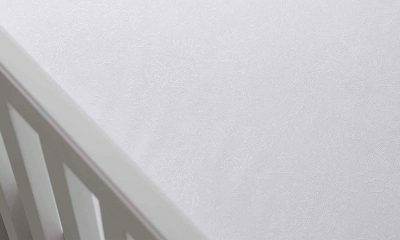 Before you start shopping for a safe organic baby crib mattress, you’ll want to know what the potential benefits could be. After all, buying a crib mattress is one of the most important purchases that you will make for your new arrival. Although organic crib mattresses are usually more expensive, they create a healthier sleeping environment for your baby. As we mentioned above, they contain no harmful chemicals for your baby to breathe in as they sleep. Therefore, an organically-certified crib mattress provides extra peace of mind. This is especially true if your little one suffers from any kind of health condition. So, you may well feel it’s best to spend a little more to get a safer and healthier product for your precious bundle. Nowadays, many parents are concerned with making purchases that benefit the environment. First of all, chemicals released by non-organic mattresses harm the environment as well as your baby’s health. Also, organic mattresses are often made of recycled materials. Furthermore, many organic mattresses nowadays are fully bio-degradable. This means that your mattress will not harm the environment when you are finished with it. 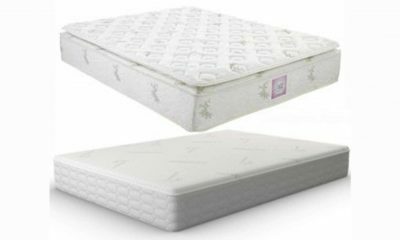 The chemicals contained in non-organic mattresses can trigger allergies in a new-born baby. 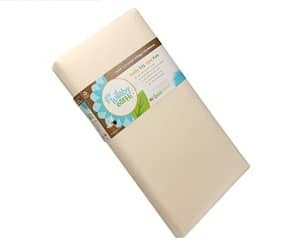 Furthermore, if you already know that your baby suffers from allergies, an organic mattress may well be the way to go. They contain no toxic chemicals to cause allergic reactions in your infant. Many modern parents are rightly concerned about the risk of SIDS, or cot death. Luckily, SIDS is a relatively rare condition. However, most responsible new parents want to do whatever they can to reduce the risk for their baby. The good news is that some scientists believe that reducing harmful chemicals can lower the risk to infants. Therefore, an organic crib mattress may well be a safer choice. What Should You Check Before Buying? To choose the very best organic mattress for your baby, you should make some preliminary checks before buying. As a new parent, it can be difficult to know which mattresses provide the best comfort and safety for their precious baby. First of all, you need to know that what feels comfortable to an adult is not what is best for your baby. While you may prefer a soft and cosy mattress, your baby needs much firmer support. This is because their tiny bodies need extra support as they grow. Also, a soft mattress can pose a risk to your baby’s health. That’s because they can conform to the shape of your baby, potentially causing their face to sink in. This can reduce their breathing, which is a safety concern. Finally, any new parent will tell you that a comfortable mattress is the key to a happy baby. Babies need a lot of sleep to develop, and an uncomfortable baby will not sleep soundly. This leads to night time waking and a cranky baby during the day. Furthermore, a comfy mattress will help your baby to get the sleep they need to grow up healthy and strong. A good way to test a mattress is to press down with your hand. It should spring back quickly and feel firmer than is comfortable to your adult taste. A breathable mattress is extremely important for the health of your baby because it allows the air to circulate. Also, it prevents overheating during the night. Why is a well-fitting mattress so important? Well, any gaps between the frame of the crib and the mattress can be dangerous because your baby could get caught or stuck. So, measure your crib frame beforehand and check that the mattress will fit flush to the sides of the crib. As a rule, you should not be able to fit more than two fingers between the crib frame and the mattress. Luckily, most cribs fit a standard mattress size. Therefore, it should be reasonably easy to find one that’s a good fit. On the other hand, if you have an older model or a homemade crib, you may need to search a little more for a mattress that fits. As any parent will tell you, with babies come leaks and spillages. 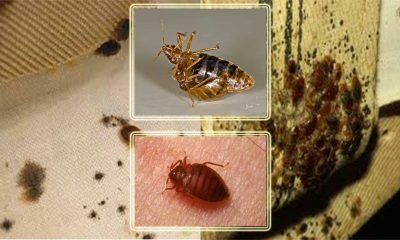 If these can soak into the mattress, they can form mold and mildew. This poses a risk to health. Also, any pee soaking into the mattress can cause harmful bacteria to build up, which is unhygienic. A good mattress will be either waterproof or water-resistant, preventing this issue. Also, this makes any spills easier to clean. However, as we mentioned earlier, please ensure any mattress you purchase does not use PVC if you are concerned about toxins. 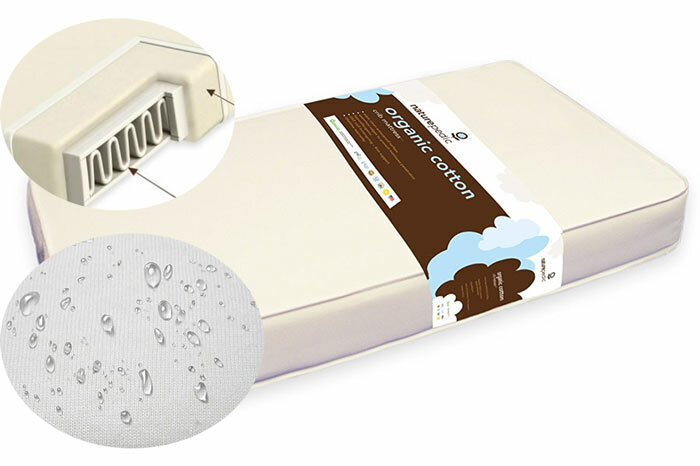 An organic crib mattress will use safer materials to provide water resistance. Hopefully, now you’ve read our handy guide, you’re one step closer to selecting the best organic crib mattress for your baby. As your little one will spend so long in their crib, we are sure you’ll agree that this is a decision not to be taken lightly. As you can see, there are many benefits to purchasing an organic crib mattress. Also, you now know what to look out for when shopping around for a mattress. 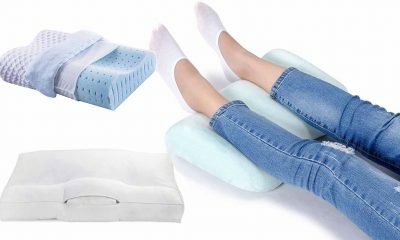 In this article, we’ve reviewed five excellent products that would all make a suitable sleeping surface for your little one. However, like any product, they all have both benefits and drawbacks. Before you make a final decision, be sure to carefully review all the product pros and cons to ensure it is the right product for you. So, to your little one, sweet dreams!